Venue: Titanic Quarter, Belfast Date: Saturday, 6 September Time: 22:30 BST Coverage: Listen to live commentary on BBC Radio 5 live and a full re-run of the fight on 5 live sports extra from 08:00 BST on Sunday. Carl Frampton has promised Northern Ireland fight fans that the IBF super-bantamweight belt will stay in Belfast after Saturday's world title contest with defending champion Kiko Martinez. "It's up to me to stay smart. As long as I stay focused there's only one winner," said Frampton after a lively weigh-in at a packed Ulster Hall. 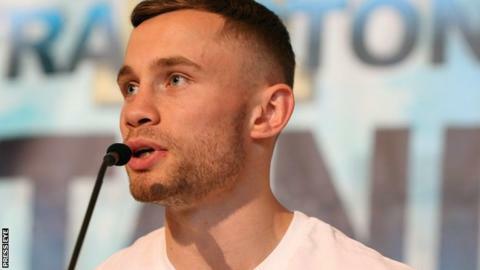 Frampton is a heavy favourite having beaten Martinez in February last year. Saturday's fight will attract Northern Ireland's biggest ever boxing crowd. It will take place in a purpose-built, 16,000-capacity arena in Belfast's Titanic Quarter and, as well as the UK and Ireland, the fight has also been sold to television in the United States, South America, China, Japan and the Middle East. Should Frampton win, he will become Northern Ireland's first bona fide world champion since fellow Belfast fighter Wayne McCullough in 1996. Frampton won the last contest with Martinez by ninth-round stoppage in a savage bout that left the Northern Irishman with a perforated ear drum. "Every single one of his fights he has boxed the same way. He comes forward, he's aggressive and has an exciting style that the crowds like," said the Belfast boxer. "I think our styles clash well and make for a good fight but I don't see him doing anything different and expect him to come head first, trying to knock me out." Boxing fans throughout Northern Ireland unite behind Belfast fighter Carl Frampton ahead of his world title bid. Martinez bounced back from his defeat two bouts later to surprisingly take a portion of the world title off Jhonatan Romero and the 28-year-old Spaniard has gone on to make two successful defences. While Frampton insists Martinez is incapable of change, the 27-year-old, who is managed and promoted by former world featherweight champion Barry McGuigan, feels his own performance is constantly improving. "I don't think you've seen the best of me. There's still plenty more to come. I can see and feel the improvements every day in training and after sparring. The best is definitely yet to come." Victory on Saturday could open up potentially lucrative unification bouts with WBC champion Leo Santa Cruz or British rival and regular WBA titlist Scott Quigg, but Frampton only has eyes for Martinez. "I'm preparing for a hard, gruelling fight, that may take 12 rounds but no matter what happens I'm going to win," he said. "I also know I have the power to knock any super-bantamweight in the world out. "So it could be a 12-round points decision or it could be over in the first round. I'm preparing for a very hard and brutal fight, then we can talk about future fights."